So... I have this towel. It has stripes. I decided to paint my nails to match this towel. Because I can. I am still getting the hang of my lightbox. I used a striping brush and several polishes: OPI Suzi Loves Cowboys (brown creme, pictured above), Orly Pointe Blanche (white), Sinful Colors Bamboo (teal), Sally Hansen Xtreme Wear Mellow Yellow mixed with a bit of Essie Shake Your $$ Maker (lime green), and the shimmery taupe/tan colour is a pretty but unnamed colour by the brand Markwins. Oh dear, the time I spent going over these lines and making them as perfect as I could! I did at least three passes with each colour, then did the white + brown dots along the half-moon edge with a dotting tool. Topcoated with INM Out The Door. 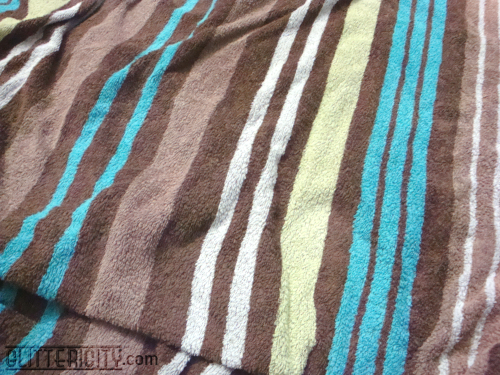 As you can see, I did the same number of stripes as well as relative width as on the towel (as well as possible, anyway). I had to forego the double stripes of white and teal on the smallest finger--just wasn't enough room! But I'm digging the retro colour scheme, and I think the dots on the edge contribute to that look. the green side. These were a little closer in shade IRL.